As part of GameSalad’s Community Love Week, we will be profiling and interviewing several key developers within the GameSalad community. In today’s installment, we interview GameSalad Sous Chef, Ace Connell (@mynameisace). He discusses his background, inspiration for game design, and gives advice to new GameSalad developers. GameSalad: Hey Ace! Thanks for taking some time to talk with us. Can you start out by telling us a little bit about your background and what you were doing before you discovered GameSalad? Ace Connell: Sure! My grandma gave me a guitar with two strings for my 6th birthday and since that day it has consumed my life. I quit school two years early (without my parents knowing) and played guitar for 10 hours a day, every day. I was stuck because I was a great guitar player, but had no qualifications. I decided to hop on a bus, go to the local college with my guitar, and audition for a music course. I got accepted. I did two years of college, followed by three years toward a degree. 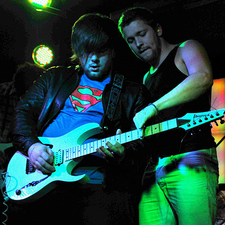 After university I was playing guitar for a lot of recording artists and touring the world. In all the craziness of flights and living in hotel rooms, I started the band Ellerker with some local guys. This band took off pretty well and soon after, I was touring and recording with my own music. GameSalad: How did you become interested in game design and find GameSalad? Ace Connell: I’d always been fascinated with video games. As a kid I had an Atari 2600 and a Sinclair Spectrum 128k (it’s crazy to thing that we download games off the App Store in seconds now, when we used to play games off cassette tapes!) as my first consoles and played Pitfall and Puzzle Bobble to death. After playing those consoles, I got hooked on Nintendo. I loved the colorful, fun attitude that Nintendo had toward video games and I spent my childhood with either a guitar or a SNES controller in my hands. Around the time that we formed the band, I bought an iMac and some recording equipment so we could record demos in my attic to show our record label. I was bored one day and remembered that I used to make games with my buddy on his 333 MHz computer using software called RPG Maker 2000 and I wanted to know if it was available for OSX. It wasn’t. I now had it in my head that I wanted to create games again in the spare time I had off from touring and recording, so I turned to my good friend Google. The first thing I found was something called GameSalad by Gendai Games. I watched a couple of the YouTube videos, downloaded it and was hooked. GameSalad: Tell us about your early development with GameSalad. Ace Connell: After I fired up GameSalad I was (almost) instantly at home! I went over to the GameSalad forums and posted a couple of questions and before I knew it, I was using GameSalad 6+ hours every day. Ellerker had a tour booked, so I bought a Macbook just so I could use GameSalad on tour and that’s where I did the majority of my learning. On my own, with no internet connection. The forums and the Cookbook (although that wasn’t created when I started) are fantastic resources to learn from, but being without an internet connection forced me to learn how and why things worked instead of just doing it that way because some guy on the internet said so. Without having a programming background, I looked at things a different way – this seemed to be an advantage and a disadvantage all in one. GameSalad: What is your favorite genre of game? How has that genre influences the type of games that you like to make with GameSalad? Ace Connell: Growing up with games like Pitfall on the Atari, Kid Icarus and Super Mario Bros. on the NES and Kirby’s Dreamland on the Gameboy, platformers have always been my favorite game genre and I hope to one day finish creating a huge platformer using GameSalad. 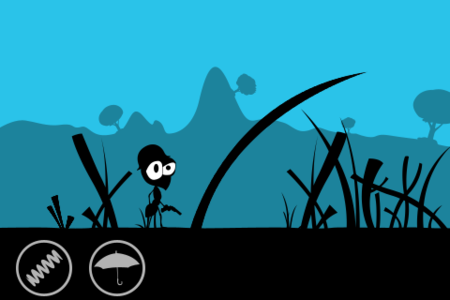 The game I’m currently working on, Aldo the Ant, started life as a platformer (as many of my games do) but morphed in to something slightly different. It’s a platform game at heart, but instead of using a D-pad and A/B buttons, it has items at the bottom of the screen that you drag in to the game to help Aldo complete the levels. I have always avoided using a D-Pad/joystick and buttons in iOS games because the iPhone and iPad are unique in the fact that they are completely touch based platforms, so it seems a shame to me to not use the iOS devices to their advantage with swipes, tilts and taps instead of creating a fake on-screen controller. 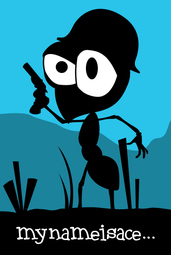 Aldo the Ant will be the first game I’ve worked on myself for a long time because I have been creating games for clients full-time when I’m at home using GameSalad – Anybody who says that you can’t make a full-time professional living using GameSalad are either wrong, lazy or both! GameSalad: How has your development experience been with newer GameSalad features like Tables or In App purchase? Ace Connell: The huge advancement we’ve had in recent months is tables… Tables have really opened a LOT of doors and taken GameSalad game creating to whole other level. Optimization, to me, is one of the things I spend the most time on. I plan my optimization from the beginning and am constantly optimizing as I create games and tables have made that process a whole lot easier for me. In the coming months we are getting a GameSalad creator that is free of LUA and the builds will be lightning fast… Things are looking great for the future of GameSalad and my fellow developers are pushing the tool further and further each day and getting fantastic results in their games! GameSalad: Any advice you would give to developers that are new to game design or GameSalad? Ace Connell: If you’re new to GameSalad, my advice to you would be to read and absorb as much information as you can! The Cookbook is fantastic and the GameSalad forums are a friendly place to ask any questions you have. In the forums there are so many great developers who tirelessly spend their time helping people and making the GameSalad community a better place. Once you have gotten to grips with the basics, create a game from start to finish and try to not give in and ask on the forums if you are struggling, just go for it and don’t stop until you’re finished. This way you will not only learn the how’s and why’s things work because you’re thinking for yourself, but it will also prepare you for the mindset needed to create a full game from start to finish. This is something which is underrated, because it can be extremely demanding and tiring to see your game through to the end. GameSalad: Thanks so much for talking to us Ace! And best of luck with Aldo the Ant. We can’t wait to see how that project turns out.